One of the most attractive local crickets we have around is the aptly named Handsome Trig (Phyllopalpus pulchellus). The name "Trig" refers to the family of crickets, Trigonidiinae, or Winged Bush Crickets, with 6 species worldwide, but only one in North America. The "Handsome" part is obvious. 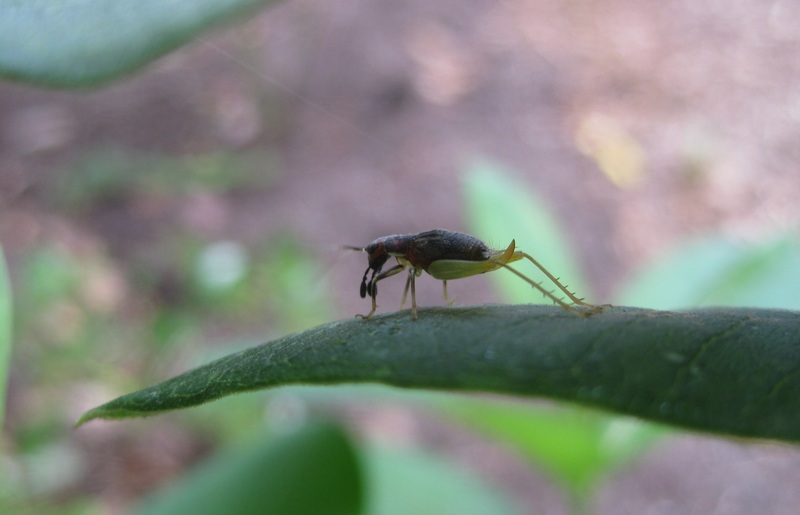 The scientific Genus name refers to the over sized, leaf-shaped mouth palps. "Pulchellus" means "pretty" or "beautiful" which is very appropriate indeed. I like this much better than its other common name: Red-headed Bush Cricket. Whatever you call it, this small (7-9mm) cricket really stands out. Some think the color combination may be protective in that it may mimic toxic bombardier beetles or perhaps jumping spiders. They feed on vegetation and do tend to stay in bushes. The males, as in most crickets, sing (stridulate) using their wings. The females have an extra middle extension, the ovipositor, used to lay eggs. A female Red-headed Bush Cricket. This is the time of year to keep an eye out for these handsome red-headed bush crickets. If you're lucky, you'll be rewarded with seeing these neat little songsters before they jump away. Tiger Swallowtails enjoying Buttonbush blooms. My all-time favorite pollinator shrub is Buttonbush (Cephalanthus occidentalis). I've not only seen tons of bees, butterflies, wasps and even hummingbirds nectar on the fragrant white globular flowers, but you'd be amazed at all the pollinators who visit the flower heads at night. I've seen many moths, beetles, and other nocturnal fliers attracted to the white blooms and their perfume. Few people of course are out in wetlands to witness these night time visitors. A Bumblebee and Tiger Swallowtail share a Honeyball treat. This wetland shrub goes by a great variety of common names, most associated with either its habitat or flowers: Honeyballs, Button-willow, Pin-ball, Little Snowball, Pond Dogwood, Crane-willow, Globe-flower, and River-bush to name a few. It's scientific name is derived from the Greek for "head" (Cephalo) and "anthus" (flower). Occidentalis refers to it being from the West. It is in the Coffee Family (Rubiaceae). There are 6 other members of the genus. This multi-stemmed shrub can grow to 20' (though 5'-12' is more typical) right in the water, though it can take drier conditions as well. It has whorled or opposite leaves and stems. It is often one of the last native trees to leaf out in the spring. The leaves tend to turn yellowish in the Fall. Where it gets sufficient sun, it can bloom profusely, and often for more than a month at a time. The seed heads are round and to some look like old time buttons, thus its most common name. They can hang for most of the winter on the branches. The seeds float and can also get stuck to birds, both of these being the primary means of seed dispersal. According to noted ethnobotanist Daniel Moerman, numerous Native American Indian tribes were recorded making use of this woody plant. The Chickasaw made a poultice from its roots to treat sore eyes. The Choctaw not only used the roots for their eyes, but also chewed the bark for toothaches and made a bark tea for both dysentery and fevers. The Kiowa used a root solution for hemorrhages while the Koasati used buttonbush to treat rheumatism and sore muscles. The Meskwaki used the bark to induce vomiting. The Seminole made the most use of it, using it for headaches, diarrhea, urinary disorders, constipation, menstruation, fevers, stomach aches, and as a laxative. During the Civil War, Confederate doctor Francis Porcher was tasked with coming up with homegrown alternatives to items no longer available due to Union blockades and war shortages. Calling it crane-willow, he recorded that a decoction from the roots could be used for persistent coughs and as an anti-venereal. He claimed it made a pleasant syrup for lung issues: "It is thought by many intelligent persons to be a radical cure for consumption." Some people have discovered that this makes a great garden plant. In addition to its fragrant, pollinator favorite blooms, it can take some difficult growing conditions. Its tolerance for wet feet (it is considered a wetland obligate plant) makes it a good choice for rain gardens and to deal with erosion control. It can also take some severe pruning, having evolved to having beavers chew on it. The seed heads (achenes) give winter interest. Of course, few plants can hold a candle to it for butterfly and pollinator gardens. It is easy to see why I consider it my favorite pollinator shrub. A Pipevine Swallowtail on Buttonbush. 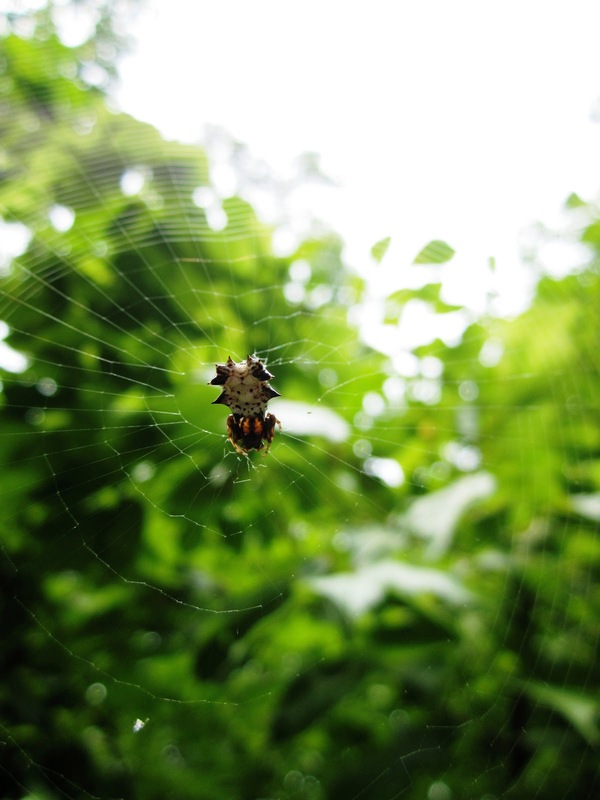 If you've taken a walk in the woods lately, you've likely run into a spider web. Chances are pretty good it was the orb web of the Spined Micrathena (Micrathena gracilis) or Spiny Orbweaver Spider. It is one of the most common woodland spiders, and it commonly builds webs across trails. Why does it always build its web across a trail where something will run into rather than parallel to the trail? Because those same trails used by people and larger animals are also the most likely to be used by the flies and other small insects that make up the vast amount of prey for these bizarre shaped spiders. Though they are a nuisance, they are harmless to people. Spiny Orbweavers are spiny and hard indeed. Female Spined Micrathena Spiders have 10 spines or points above their bodies and are cone shaped below. They can come in a variety of colors, but often are darker below and lighter colored (often white, yellow, or orange) above. This is a form of counter-shading, helping to camouflage them in the dappled light of the forest. They hang head down in the center of their webs, and from above match the darker forest floor, but from below match the lighter colored sky. They can get to about half an inch long and only the females build webs. When looking at the bottom portion, the body is cone shaped. The males are rarely seen. They only have two spines and are very slender, being only half the size as adults than the females. They often station themselves near a female's web seeking an opportunity to mate with her. They have to be careful or the larger female will eat them. The Genus Micrathena is derived from the Greek adjective for "small" and the Greek goddess Athena, who was the patron of the spinning/weaving arts. There are about 100 different species in this Genus, but only 3 in Eastern North America (with one additional one in the West). Micrathena gracilis, the Spined Micrathena, is the most common and ranges all the way to Costa Rica. Its specific name means "slender, slight, or graceful." A neat little name for these web builders. The hard spiny body of the Spiny Orbweaver is likely a protection against predators such as birds and lizards. Since the spiders rarely if ever bite, this is important. They will often try to scurry away to a corner of their web if disturbed. They will also sometimes play dead, lying there immobile with their legs tight against their armored bodies. But their most interesting defense is the low pitched buzz (stridulation) they emit when scared. Next time you approach a web, blow on it and see if you can hear it. When frightened, Spined Micrathena Spiders may pull their legs tight and rely on their armor for protection. Micrathena Spiders are in the family Araneidae, the Orbweavers. Their spiral webs are usually less than a foot across, but are placed 3-7 feet up high, perfect height for someone to walk into. When sunlight hits them, they can be really showy, giving them another common name: CD Spiders, since it might appear as though someone had strung one up across the trail. Unlike many other orb building spiders, Spined Micrathenas are diurnal, active during the day. They actually eat their webs (all but the supporting frame threads) every night. It takes them about an hour to build their webs again the next morning. About two thirds of their prey are Diptera, or flies. Spiny Orbweavers are a bit slow and clumsy, so their prey gets away a lot. They also differ from many other spiders in that they bite their prey first before wrapping them up, just the opposite of what most other orb web spiders do. These small and common orb web spiders only live about a year (the males not even that long). By late summer and early Fall, the females will lay their eggs in a fuzzy egg sac hidden off to the sides of their webs. The adults all soon die, but the eggs will overwinter and young spiderlings will hatch out to spread through the forest the next spring. So the next time you run into a web in the woods, it may be that you just destroyed the handiwork work of these little spiders. Before you curse them too badly, remember that they're harmless and doing you a favor by catching flies and other small flying insects. If you see one of their webs across your path, enjoy the craftsmanship along with the unusual color and shape of their maker.